I love tea. I mean I REALLY love tea. Ask anyone who knows me and they can attest to this fact. I have an entire cupboard filled with different kinds of tea and at least 75% of the tea is Tetley brand. I have regular original Tetley, Tetley Bold, and about a dozen different Tetley herbal varieties. Tetley is my most favourite tea. It has been this way for years and I don't foresee that changing anytime soon. It is just the best. I'm not sure when my affection for tea started but I know it runs in my family- all the women in my family drink tea and my daughter has already started her love affair with tea and she is not even 5 yet. My grandparents were British so that might have something to do with it :). After Aiden was born I realized that I was never going to sleep through the night again and thought drinking coffee might help wake me up. Unfortunately I hate coffee. I have tried to like it... honest. But I just don't. I can drink a cup if I have to... with lots of cream and sugar to mask the actual taste. But it has never become part of my day to day life. Canada’s first and only Tea with the caffeine of coffee, steeped in the goodness of tea! As the cold weather sets in, the mornings may be getting darker, but Tetley gives Canadians an all new way to rise and shine with Tetley Perk. Starting in November, as the kettle whistle blows, Canadians will be the first in the world to wake-up to the only tea in Canada that contains the same amount of caffeine as coffee. Steeped in Tetley’s 170 year old tea-making tradition, Tetley Perk quenches Canadian tea lovers’ thirst for a delicious cup of orange pekoe tea that tastes just like their beloved Tetley orange pekoe but has all the perk power of a coffee! Tetley Perk’s tasty Orange Pekoe blend is enhanced with naturally sourced caffeine extract. The total amount of caffeine in each 175 ml cup is 100 mg – the same as a cu p of coffee. This compares to the original Tetley Orange Pekoe that contains a modest 34 mg of caffeine. If you enjoy a Tetley Perk at breakfast, you could easily consume an additional eight cups of original Tetley Orange Pekoe and still stay under Health Canada’s recommended daily intake of caffeine, which is 400 mg of caffeine a day. Ok- did you catch that? Same great taste but with the same amount of caffeine as coffee!! If only Tetley could have come up with this brilliance 9 years ago :) . I have been drinking Tetley Perk daily now for a couple weeks and I definitely notice a difference! It really does still taste the same as original Tetley but I can totally tell that I have had triple the caffeine. I get migraines. Lots of migraines. And caffeine actually helps dull the pain a bit sometimes so I have also been drinking Tetley Perk when I feel a migraine coming on. I will have to keep going with that experiment to see if it makes a difference for sure. Also? 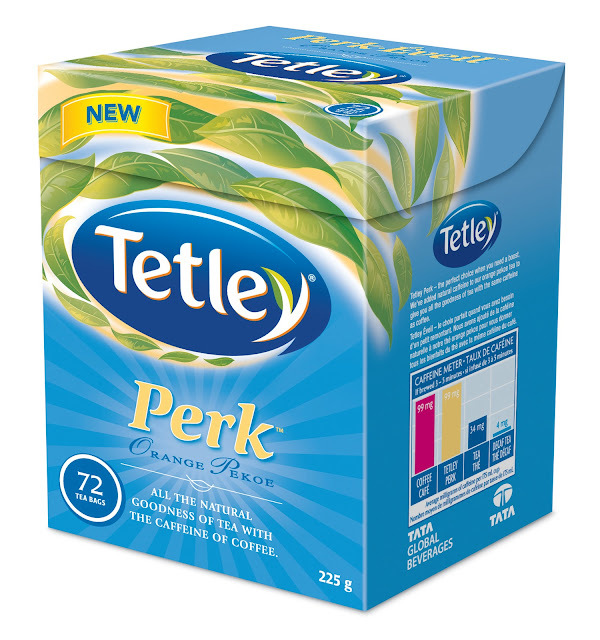 I kind of love that Canada is the only place in the world to have Tetley Perk - Yay Canada!